What we lacked in squash this year, we made up for in beets! 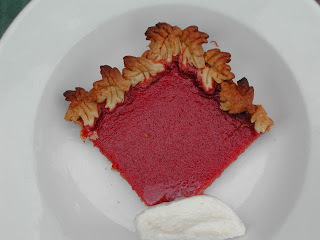 I thought if one can make pumpkin pie, why not beet pie. The color is quite beautiful, though I found it didn't permeate the entire filling. The sweet yet biting whipped cream offered a nice compliment. You can use fresh beets or you can use canned beets. For fresh beets, i recommend peeling them before cooking and cutting them into small cubes. Then roast them in oven, or you can just boil them. For canned beets, you will need two cans. I heat them in their juice on the stove top. Beets are a bit "hard" and they need to be rather smooth for this recipe. The beets are easiest to "mash" in a food processor. Do not over bake the pie. 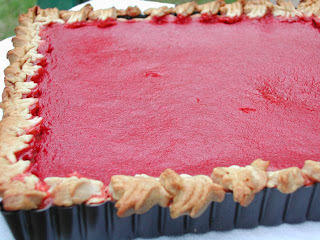 We have all seen pies served where the filling is pulled away from the crust, or the filling is cracked. That occurs when you over bake. You want the center to be firm, but just. the pie will continue to bake once it is out of the oven, so the second you see the center firm up, pull the pie out of the oven. The Horseradish Whipped Cream is a matter of taste. I like spicy food, so I use 1 tablespoon of prepared horseradish. That might overwhelm some, so I recommend adding it a teaspoon at a time. Combine the the dry ingredients to incorporate the spices evenly.